The week of February 3rd, I worked in the office. Can you guess what I did? 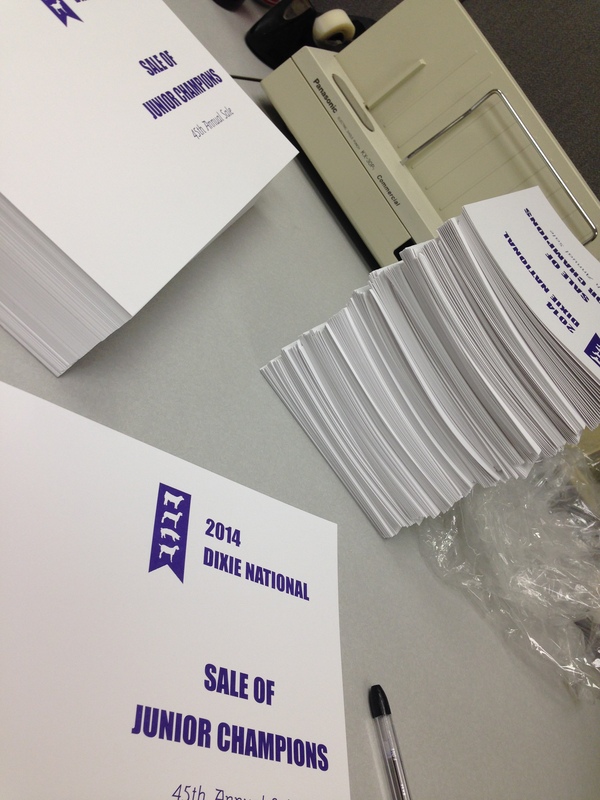 Yes, prepared documents for Dixie National Judging Contest! We needed more scoring cards for the contestants to use for their class placings. So I was able to practice my cutting skills for a few hours this week. Then, Friday, I was able to ride to Jackson with some of the members of Mississippi State’s very own Livestock Judging team to the big event. The contest began Saturday morning. My job at the contest (along with four other individuals) was simply to be a group leader. I lead a group of ~25 college students (from all over the country) to their classes. During the class I was to make sure contestants stayed on task and remained quiet. As each class ended, I then collected their score cards and gave them to a runner – in preparation for the next class. It may not sound like a huge job, but this weekend it really showed me that every member of a team is a vital component. I really enjoyed myself. Not to mention, everyone was so friendly and helpful. And what’s not to love about a beef cattle show? I am so thankful for the experience – I would love to come back and do it again. Who knew interning could be so much fun! This week at the South Farm has been busy due to the upcoming Dixie National Livestock Show and Rodeo. Not only will we send cattle down to be used for the Judging Contest (more to follow on it), but we also have to prepare for many of our crew to be gone as well. First, we had to feed all the animals on the farm. Due to the cold weather front we have had, we also had to put out some more hay for all of the cows. Unlike last week, when the main concern was ice, this week we had a new challenge of mud. At the South Farm, we all work together to help out with any tasks that need to be done. With this being said, I helped with Rachel’s (a PhD student under Dr. Brian Rude) project drawing blood from her calves. We also had to fix the weigh system on the feed buggy so we could feed the animals in the mornings. As the week wound down, I helped to get the truck and trailer prepared to transport cattle to the Dixie National in Jackson, where a group of Charolais bulls will be used for the Collegiate Beef Judging Contest. We’ll also transport market animals back from the Sale of Junior Champions to be used for ADS classes. It has just been another busy week out at the South Farm. Well, in case you were wondering, the printer and I are still not friends. Luckily we found a new way to print pictures out to put in mason jars to make center pieces for various upcoming events. The center pieces were my big project for the week. The pictures that caused so much trouble consisted of old MSU Animal and Dairy Science Images that were focused on beef cattle as well as beef images from past Dixie Nationals and other shows. It was very interesting to go through all of the old pictures to see what shows and herds looked like in the past here at MSU. Especially the Block and Bridle Club. As the week went on the office sure did get quiet due to everyone heading down to Jackson to kickoff Dixie Nationals. I can only imagine what next week will be like! This past week in the Beef Cattle Extension offices, we have been busily preparing for the Dixie National Collegiate Livestock Judging Contest. Livestock judging is a fun part of the cattle industry that enables us to improve our herds and form relationships with other producers. Additional to Dixie National preparation, the Beef Extension offices are putting together materials for the Artificial Insemination School. This is a great event that brings beef cattle producers to the University and furthers reproductive physiology technologies. As a past participant and active helper in the program, I highly recommend this program to students and producers alike! Click the link below for more information http://msucares.com/livestock/beef/aischool.html. On January 25th I was able to attend the Northeast District Livestock and Dairy Show in Verona, Mississippi at the Lee County Agri- Center with Julie White, Oktibbeha County Extension Director. I was able to see the Market Lamb Show (wool and woolies), and the Beef Show. The Market Lamb show was separated into divisions by age of the exhibitor for showmanship and then breed (Oxford & Shropshire, Hampshire, Dorset & Other Breeds, and Crossbred) weight (light-weight, medium-weight, heavy-weight), and lastly, natural color. The Beef Show was segregated by age of the exhibitor for showmanship, and classes for the all breeds. Breeds represented in the show were Angus, Hereford, Santa Gerturdis, and Charolais. Our main objective during the beef show with Mrs. White, however, was to make sure a new family to the circuit was comfortable, and punctual for their events. It seemed to me, that the beef cattle most characteristic of their breed as far as size and stature were often placed higher than those that were not (however I was unable to watch the show in its entirety). This week I also went out to The South Farm Beef Unit where I video-taped Winter Hay and Feeder Management, Visual Identification Methods, and sorting of cattle by age and then weight to be used for the MSU Beef Cattle Youtube Channel (http://www.youtube.com/user/MSUBeefCattle) . I also, helped in the office where I cut documents and assembled booklets for the Dixie Nationals and addressed envelopes for the Extension office. Hello again! This week has been busy with preparation for the upcoming Dixie Nationals! We are just one week away! My jobs have been a mixture of a little bit of everything this week. They have ranged from folding the Sale of Champions Sale Booklets to helping stuff and seal over 400 envelopes to send to the supporters of the annual sale. And in case you didn’t know, that is a lot of envelopes! I now also have a new enemy….. the ADS printer. It’s horrible. In case you ever want to size down the KB of a picture, and have it print directly through a media hookup, don’t, just don’t do it! See ya next week. Maybe by then I will be able to befriend the printer!